1) Femoral nerve block is now considered the standard of care for acute pain management for femoral fractures including hip and femoral shaft fractures. 2) Femoral nerve blocks are most beneficial when placed as quickly as possible after injury and should be placed by qualified ED staff as soon after presentation as possible after appropriate evaluation for high-risk features and contraindications. 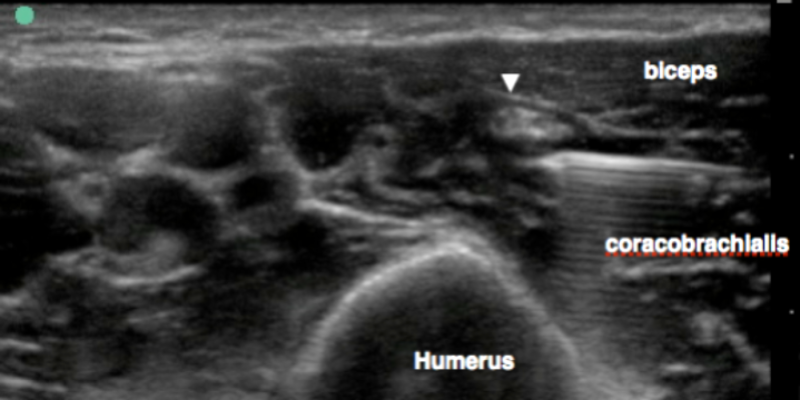 3) Femoral nerve blocks have several serious potential complications including: a) potential masking of the clinical signs of an emerging compartment syndrome leading to delay in diagnosis, b) nerve injury c) local anesthetic toxicity. b) Clinical signs suggestive of femoral nerve injury or deficit. c) Clinical signs of a significant vascular injury with potential to produce elevated compartment pressures. 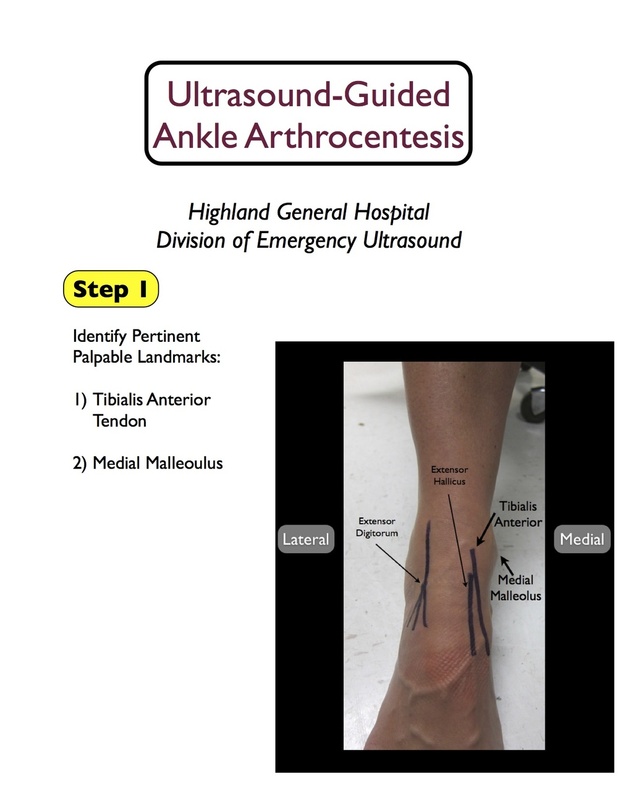 A common question from ED docs getting started using ultrasound-guided regional anesthesia is around working with the orthopedic staff who may not have familiarity with regional anesthesia. Here are some scenarios and potential ways around them. "Don't block until I (orthopedist), I need to be able to perform a neurologic exam"
I can understand where they are coming from. They don't see the patient in pain in front of them, they don't feel the urgency to get pain under control right away. But from the perspective of the patient this is just means needless suffering. What's more is that long-term once the orthopedist is able to see the results of improved analgesia and anesthesia using blocks, most are "converted" and start to not just allow, but expect them to be done in the ED. 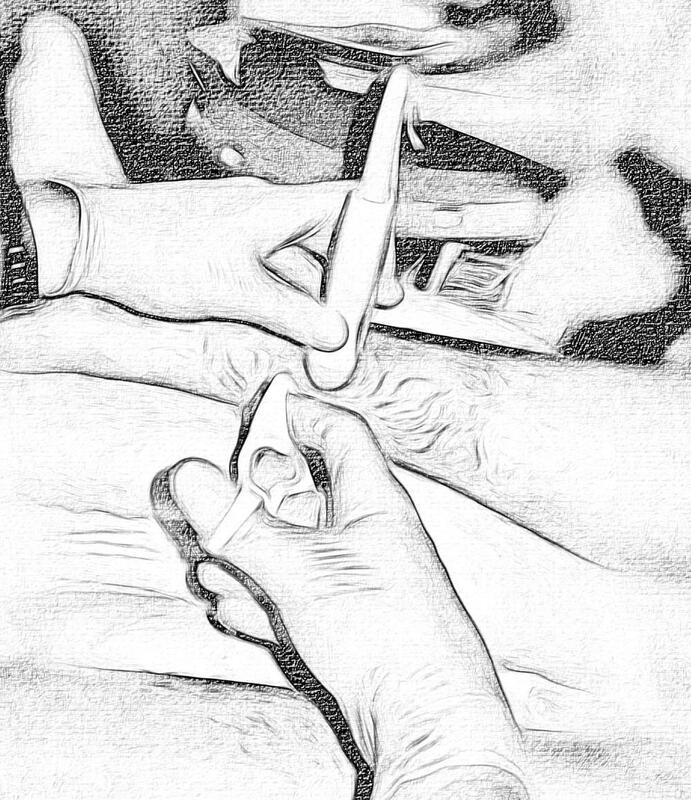 Create a consensus pre-block neurologic exam protocol that is injury specific. Start with hip fractures and work with your orthopedist to identify what specific physical exam tests she/he would like performed. Be as specific as possible, such as, "light touch on the lateral thigh 6-10 cm below the ASIS." or "plantar flexion strength out of 5." Create a way to document this. Take ownership of the integrity of your exam so that it can be trusted. Agree on the goal of as short a "door to block time" as possible and discuss how long is too long to wait. If the orthopedist is 10 minutes or less away, spend that time consenting and getting ready for the block, let him/her get the exam then place the block. Waiting 2 hours on the other hand is not acceptable. Orthopedists can learn blocks too. This is one of the best ways to get them up to speed. Again the femoral nerve block is a great place to start. Once they see the power and benefits, you get their buy-in. "Don't block him, he might develop compartment syndrome"
The data is patchy and inconsistent on compartment syndrome, know one really knows what is a late sign, what is early, what is best way to monitor etc...What we can all agree on is that it is a devastating injury if there is a delay. In the face of ambiguity and fear or complication, some orthopedists may simply "opt out" and blanket oppose blocks. Start with the femoral block , the risk of thigh compartment syndrome is incredibly rare in most traumatic femoral/hip fractures. This should be a great place to start to get the orthopedist comfortable and used to the blocks. Use short-acting local anesthetic. Try chloroprocaine or lidocaine so that the block wears off in at most a few hours. 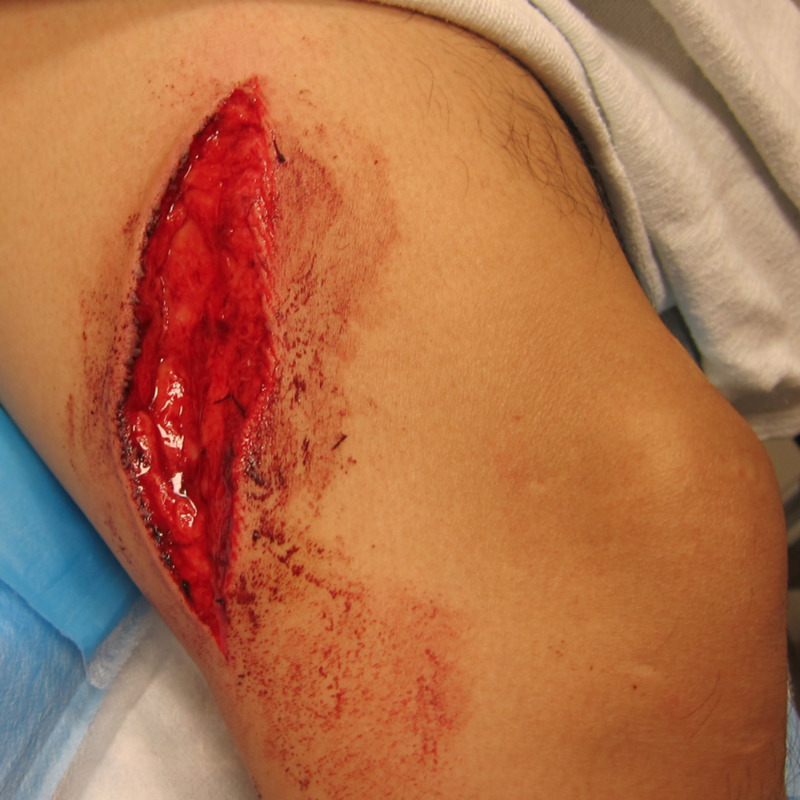 If at the time of block there are no physical signs of compartment syndrome, it would nearly impossible to rapidly develop acute compartment syndrome in just a few hours. Avoid tib / fib fractures until you have a very well developed relationship with your orthopedist and a robust protocol to monitor the patient. Ban Tsui, an anesthesiologist at University of Alberta, has devised a simple catheter that is placed much like a regular IV line. Our initial experience has been very impressive indeed. Consider this case. 64yoF head-on MVC at freeway speeds with dislocated shoulder and shattered femur. She was initially in severe pain despite sedation and IV analgesia complicated by severe respiratory depression. An interscalene block was placed and the shoulder was reduced effortlessly. 2-chloroprocaine was used for its fast onset and low toxicity profile. A perineural catheter was placed at the femoral nerve without complication and doses on three separate occasions during here. The analgesia was excellent, she remained alert and comfortable and underwent multiple transfers for placement of a Steinman pin and repeat xrays and CT scanning. 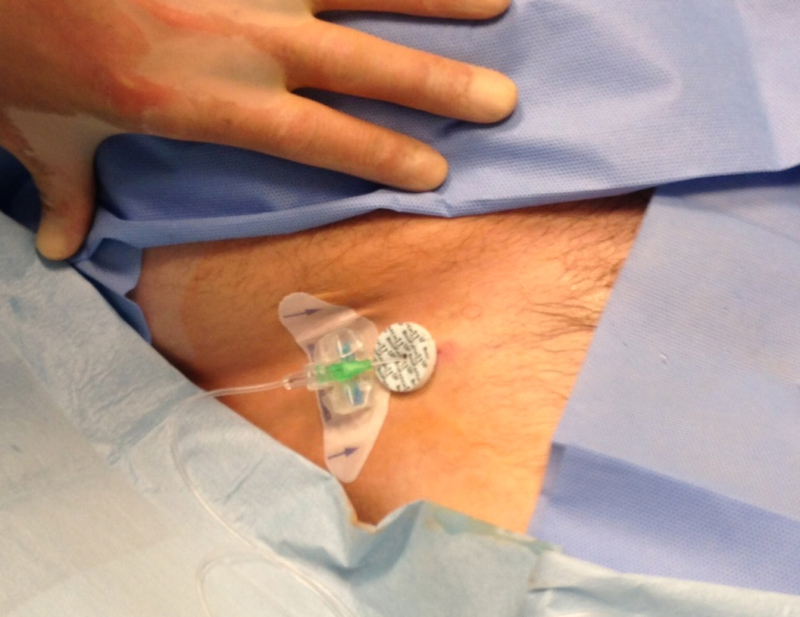 Catheter during redosing 6 hours after initial placement. Arun and Charlotte recently had a case of a patient with a posterior hip dislocation who also was in a cervical collar, intoxicated, with multiple medical problems. Not the patient any of us look forward to sedating without a bit of trepidation that they might lose their airway and need an intubation that could be difficult. Arun placed a femoral block and reduced the hip with ease under only light sedation. The idea of a femoral block for a hip dislocation is very new with the only description of it appearing just recently: HERE. This group from Turkey report a similar experience. 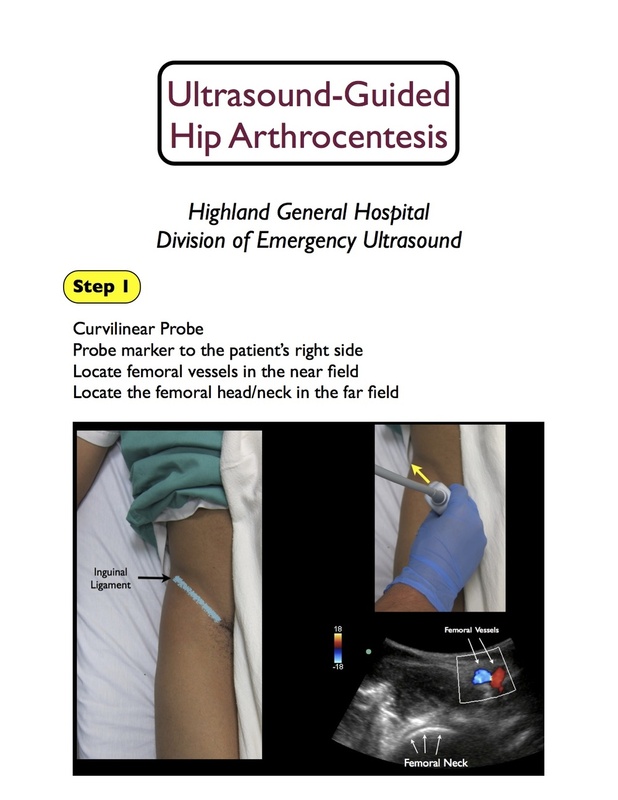 The area of analgesia and anesthesia provided by a femoral block clearly does not include all of the hip joint, (review the block HERE ) but maybe for some patients it may relax the crucial muscles that hold the hip out. Certainly something worth considering. CASE: Bilateral calcaneal fractures after falling off a roof. He was on a roof and then somehow got into a water fight with kids. The kids won. He slid face first down the roof, grabbed the gutter, did a flip and landed on his heels on the concrete below resulting in bilateral calcaneal fractures. In the ED, given the mechanism, he required a trauma service consult and an orthopedics consult combined with pain film imaging of his lower extremities and lumbar spine CT.
To accomplish all this, the patient was in the ED for several hours. Morphine took the edge off, but he complained of persistent 9/10 pain. This works so well because the calcaneous itself is innervated primarily by its namesake nerve that is a terminal branch of the posterior tibial nerve. The patient will loose sensation to the sole of the foot but retain motor function at the ankle and toes. The advantage of the selective block is that it should not disrupt the neurologic exam in a patient with a potential lumbar fracture. The disadvantage is that the associated trauma such as ankle sprain will likely continue to cause some pain. I would consider this an entry level block. The positioning is straightforward, the needling shallow, and the major structure to avoid ( the posterior tibial artery) is easy to identify. The only issue that comes up is that although the nerve ALWAYS runs adjacent to the artery, it can at times run deep to it, anterior to it, or posterior to it. If you are lost, try gently hydrodissecting with saline around the posterior tibial artery just above the medial malleolus and the typical honeycomb nerve should become clear. You guessed it. It worked beautifully. We placed bilateral blocks and his pain went to 1/10. He was very grateful and the workup could be completed in comfort. He was discharged home with an oral analgesic regimen. The musculocutaneous nerve (arrow) in the distal axilla runs in a fascial between the biceps and the coracobrachialis muscles. The musculocutaneous nerve contributes to the sensory innervation of the elbow; below the elbow it becomes the lateral cutaneous nerve and supplies the skin of the lateral forearm. 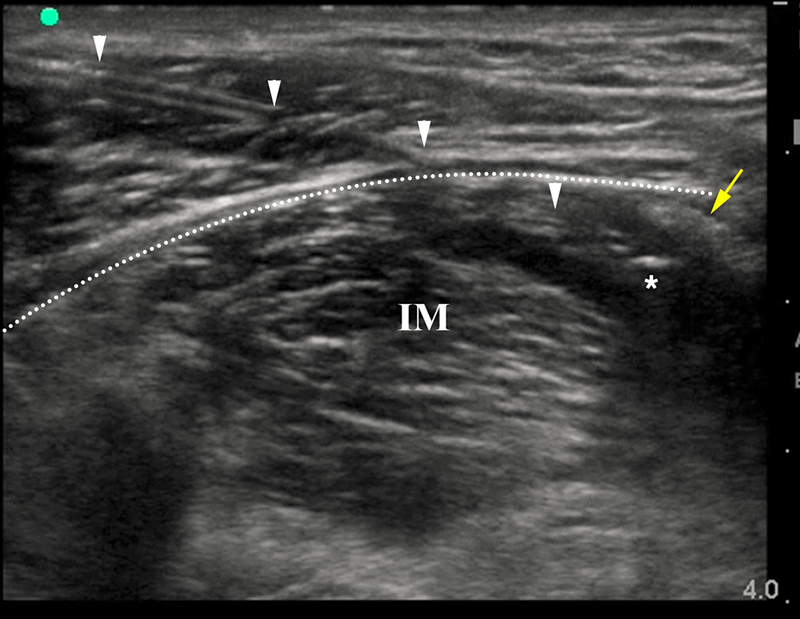 Ultrsound-guided block of the muculocutaneous nerve is best done with arm abducted allowing convenient access to the axilla with an in-plane approach. The nerve is easily identified 1-2 cm cephalad to the axillary nerves and vessels. Would love to here your comments! Mantuani and Arun have put together a great set of slides to walk you through an ankle tap. Download the PDF HERE or review in online from the left sidebar. How would you block this? 38-year-old man was assaulted with a box-cutter resulting in a large laceration across the lateral aspect of his neck. The laceration extended through the skin, subcutaneous fat, and superficial fascia revealing the underlying muscles and parotid gland. CT/A of the neck showed no injury to the great vessels and the patient needs wound irrigation and closure. With a single injection superficial cervical plexus block of 6mL 0.5 bupivacaine this patient had complete anesthesia. The saphenous nerve is a pesky nerve we tired to ignore for awhile. The reality is that for trauma in the lower extremity, you must always consider the need to add a saphenous block to your popliteal sciatic block. 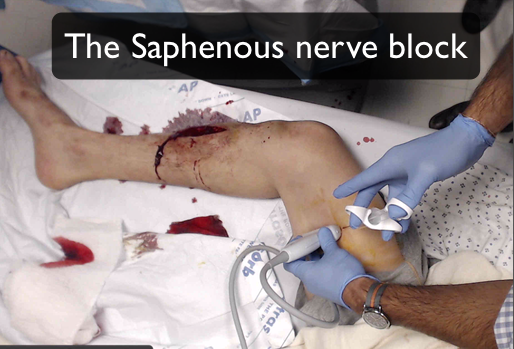 In particular, any wound or abscess on the medial aspect of the lower leg is pure saphenous territory. Additionally, many patients have some amount of saphenous innervation to the ankle joint itself. For a truly complete ankle block, the popliteal sciatic alone won't do. The great thing is that the saphenous block is technically very straightforward. The anatomy is a bit foreign to most of us but quite simple in the end. This VIDEO will take you through the anatomy and the block technique. 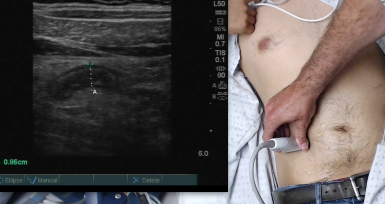 We posted a quick video of an acute appendicitis that we picked up on ultrasound rounds. All appy scans aren't this easy, let us know your experience/tips/questions.